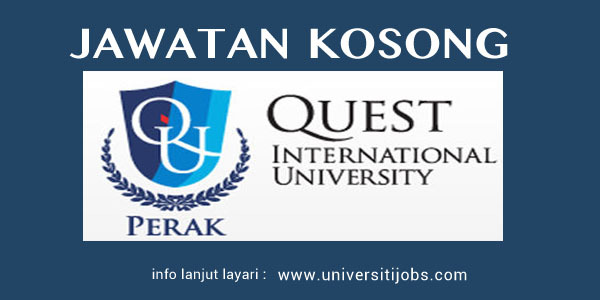 Quest International University Perak (DUO21(A) is a private comprehensive University established in the state of Perak, Malaysia with the state government equity participation. The University is committed to international standards of excellence in scholarship and research. Candidates must have postgraduate qualifications and experience in the respective disciplines, and have Malaysian Medical Council recognized undergraduate and postgraduate qualifications for Clinical fields. All Interested applicants must submit a Cover Letter indicating the post, field and level applied for and a complete and updated Curriculum Vitae listing personal particulars, academic qualifications with attested copies of certificates, teaching experience, a sample of research work and publications, current salary, a recent passport size colour photograph, and at least two (2) referees to verify qualifications, experience and ability. Applications are to be e-mailed to humanresource@qiup.edu.my stating position applied for in the subject of the email.